Topic 6. 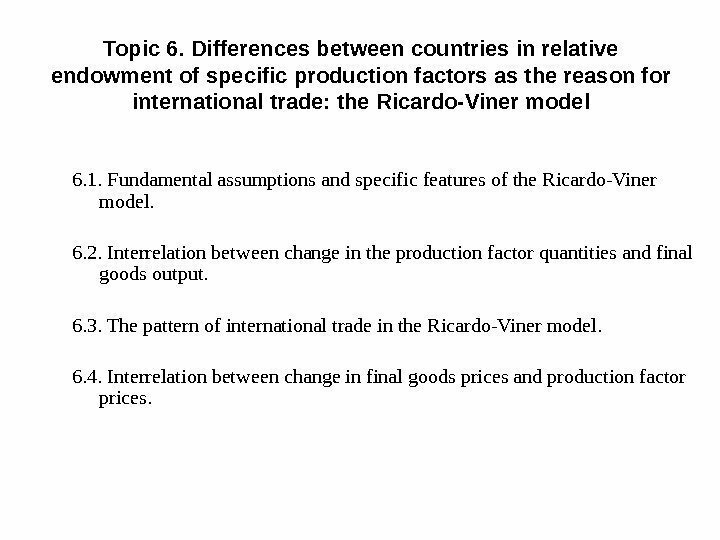 Differences between countries in relative endowment of specific production factors as the reason for international trade: the Ricardo-Viner model 6. 1. Fundamental assumptions and specific features of the Ricardo-Viner model. 6. 2. Interrelation between change in the production factor quantities and final goods output. 6. 3. 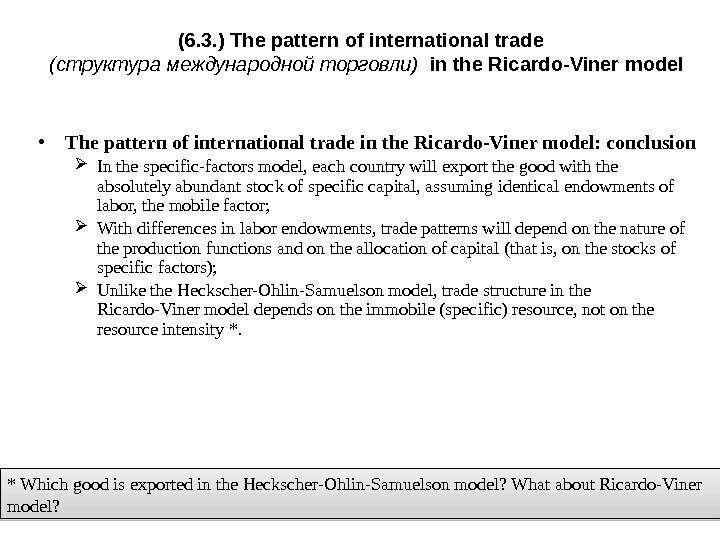 The pattern of international trade in the Ricardo-Viner model. 6. 4. Interrelation between change in final goods prices and production factor prices. Topic 6. The Ricardo-Viner model Source : Feenstra, Taylor, Chapter 3, p. 71. Topic 6. 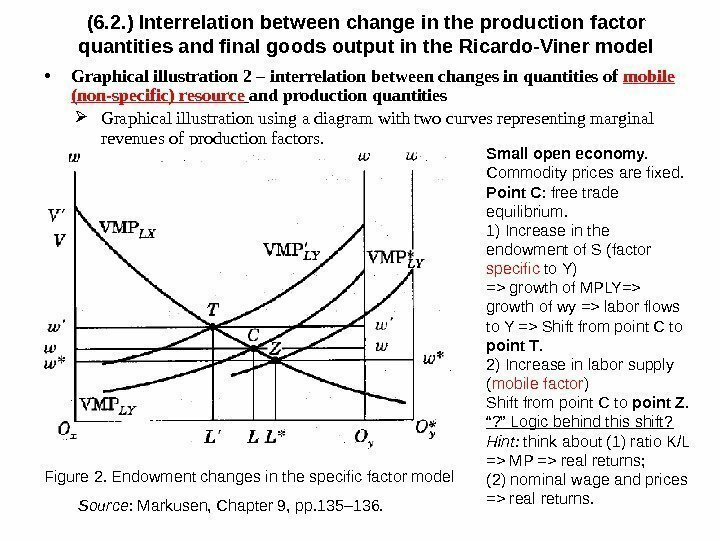 The Ricardo-Viner model Source : Feenstra, Taylor, Chapter 3, p. 72. Topic 6. 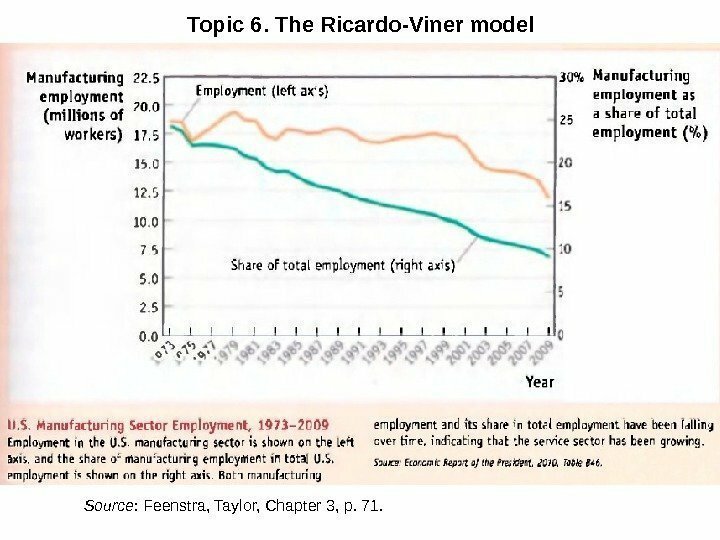 The Ricardo-Viner model Source : Feenstra, Taylor, Chapter 3, p. 73. (6. 1. ) 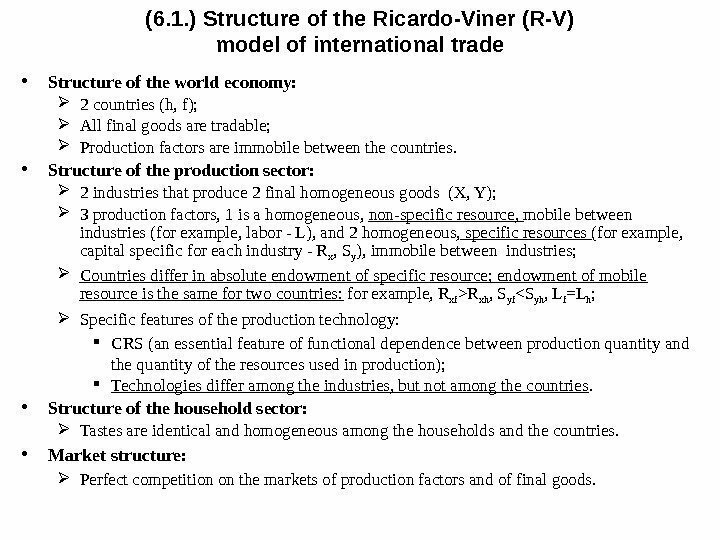 Structure of the Ricardo-Viner (R-V) model of international trade • Structure of the world economy: 2 countries (h, f); All final goods are tradable; Production factors are immobile between the countries. • Structure of the production sector: 2 industries that produce 2 final homogeneous goods (X, Y); 3 production factors, 1 is a homogeneous, non-specific resource, mobile between industries (for example, labor — L), and 2 homogeneous, specific resources (for example, capital specific for each industry — R x , S y ), immobile between industries; Countries differ in absolute endowment of specific resource; endowment of mobile resource is the same for two countries: for example, R xf >R xh , S yf <S yh , L f =L h ; Specific features of the production technology: CRS (an essential feature of functional dependence between production quantity and the quantity of the resources used in production); Technologies differ among the industries, but not among the countries. • Structure of the household sector: Tastes are identical and homogeneous among the households and the countries. • Market structure: Perfect competition on the markets of production factors and of final goods. (6. 1. ) 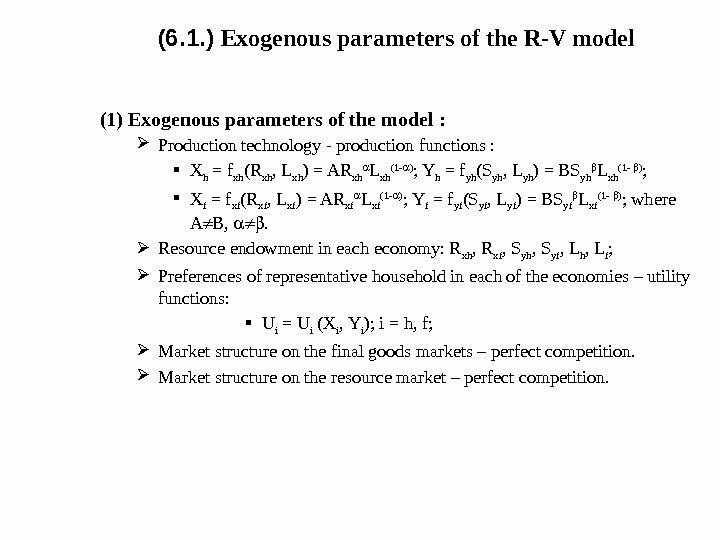 Exogenous parameters of the R-V model (1) Exogenous parameters of the model : Production technology — production functions : Х h = f xh (R xh , L xh ) = AR xh L xh (1 — ) ; Y h = f yh (S yh , L yh ) = BS yh L xh (1 — ) ; Х f = f xf (R xf , L xf ) = AR xf L xf (1 — ) ; Y f = f yf (S yf , L yf ) = BS yf L xf (1 — ) ; where А В, . Resource endowment in each economy: R xh , R xf , S yh , S yf , L h , L f ; Preferences of representative household in each of the economies – utility functions: U i = U i (X i , Y i ); i = h, f; Market structure on the final goods markets – perfect competition. Market structure on the resource market – perfect competition. (6. 1. ) 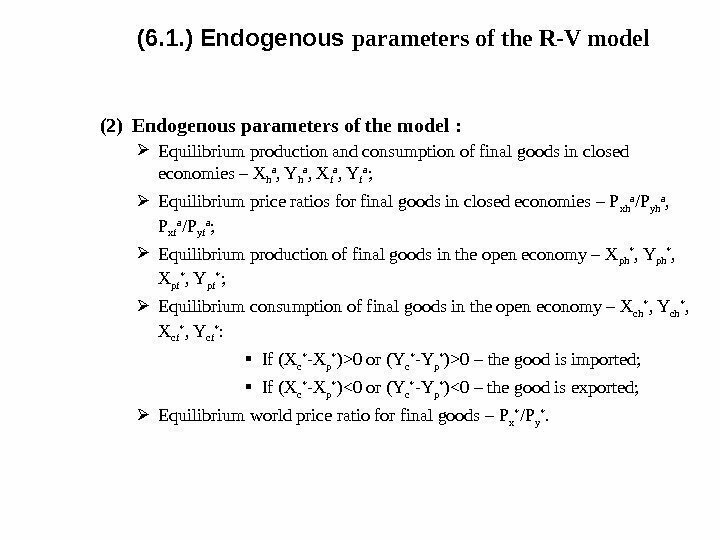 Endogenous parameters of the R-V model (2) Endogenous parameters of the model : Equilibrium production and consumption of final goods in closed economies – X h a , Y h a , X f a , Y f a ; Equilibrium price ratios for final goods in closed economies – P xh a /P yh a , P xf a /P yf a ; Equilibrium production of final goods in the open economy – X ph * , Y ph * , X pf * , Y pf * ; Equilibrium consumption of final goods in the open economy – X сh * , Y сh * , X сf * , Y сf * : If (X c * -X p * ) >0 or (Y c * -Y p * )>0 – the good is imported; If (X c * -X p * )<0 or (Y c * -Y p * )<0 – the good is exported; Equilibrium world price ratio for final goods – P x * /P y *. (6. 1. ) Specific features of the Ricardo-Viner (R-V) model Source : Markusen, Chapter 9, pp. 130– 131. Source : Feenstra, Taylor, Chapter 3, p. 60. (6. 2. ) 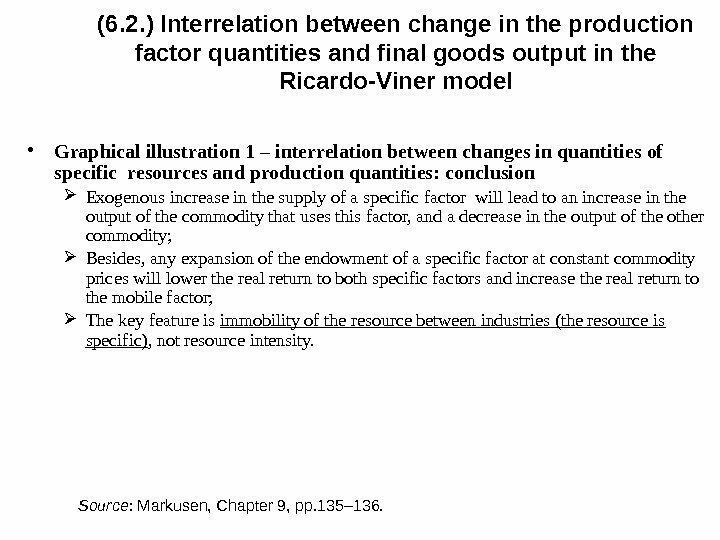 Interrelation between change in the production factor quantities and final goods output in the Ricardo-Viner model • Graphical illustration 1 – interrelation between changes in quantities of specific resources and production quantities: conclusion Exogenous increase in the supply of a specific factor will lead to an increase in the output of the commodity that uses this factor, and a decrease in the output of the other commodity; Besides, any expansion of the endowment of a specific factor at constant commodity prices will lower the real return to both specific factors and increase the real return to the mobile factor; The key feature is immobility of the resource between industries (the resource is specific) , not resource intensity. Source : Markusen, Chapter 9, pp. 135– 136. • Graphical illustration 2 – interrelation between changes in quantities of mobile (non-specific) resource and production quantities Graphical illustration using a diagram with two curves representing marginal revenues of production factors. (6. 2. ) 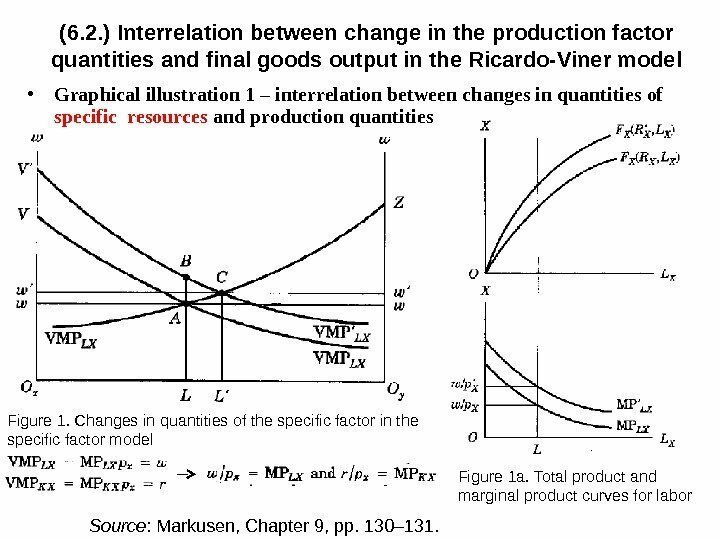 Interrelation between change in the production factor quantities and final goods output in the Ricardo-Viner model Figure 2. Endowment changes in the specific factor model Source : Markusen, Chapter 9, pp. 135– 136. Small open economy. Commodity prices are fixed. 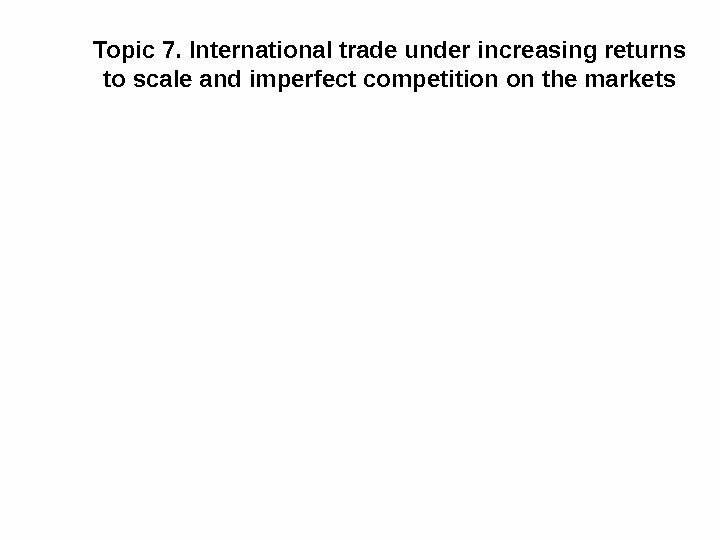 Point C : free trade equilibrium. 1) Increase in the endowment of S (factor specific to Y) => growth of MPLY=> growth of wy => labor flows to Y => Shift from point C to point T. 2) Increase in labor supply ( mobile factor ) Shift from point C to point Z. “ ? ” Logic behind this shift? Hint: think about (1) ratio K/L => MP => real returns; (2) nominal wage and prices => real returns. • Graphical illustration 2 – interrelation between changes in quantities of mobile (non-specific) resource and production quantities: conclusion Exogenous increase in the supply of mobile factor will lead to an increase in the output of both commodities; Besides, an increase in the endowment of the mobile factor will reduce its own real income and increase the real income of both specific factors. (6. 2. ) 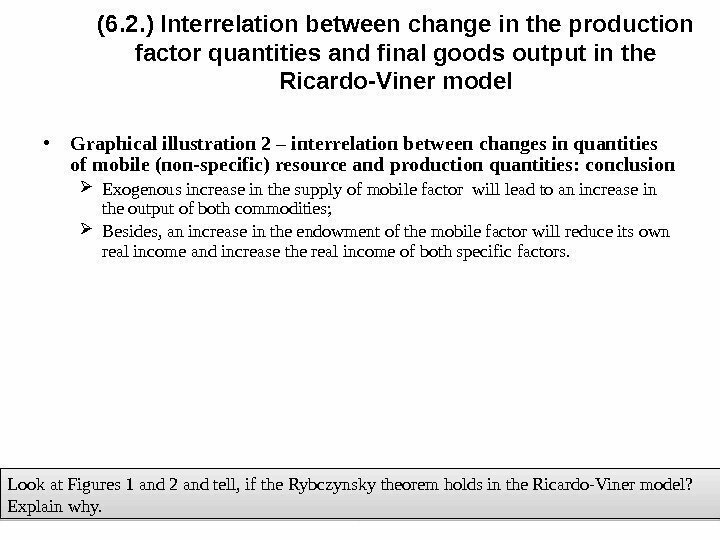 Interrelation between change in the production factor quantities and final goods output in the Ricardo-Viner model Look at Figures 1 and 2 and tell, if the Rybczynsky theorem holds in the Ricardo-Viner model? Explain why. (6. 3. ) 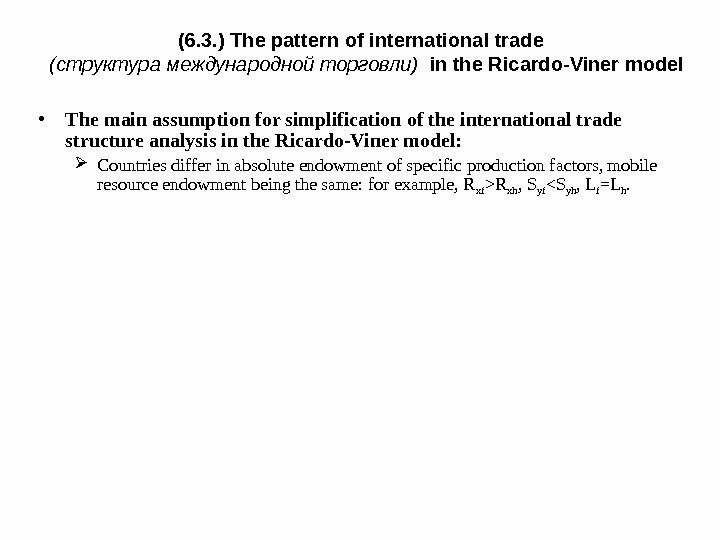 The pattern of international trade (структура международной торговли) in the Ricardo-Viner model • The main assumption for simplification of the international trade structure analysis in the Ricardo-Viner model: Countries differ in absolute endowment of specific production factors, mobile resource endowment being the same: for example, R xf >R xh , S yf <S yh , L f =L h.
(6. 3. ) 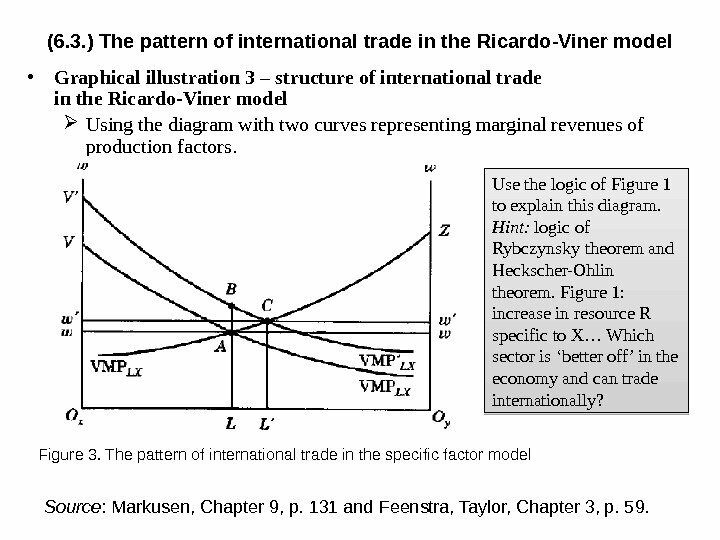 The pattern of international trade in the Ricardo-Viner model • Graphical illustration 3 – structure of international trade in the Ricardo-Viner model Using the diagram with two curves representing marginal revenues of production factors. Figure 3. The pattern of international trade in the specific factor model Source : Markusen, Chapter 9, p. 131 and Feenstra, Taylor, Chapter 3, p. 59. Use the logic of Figure 1 to explain this diagram. Hint: logic of Rybczynsky theorem and Heckscher-Ohlin theorem. Figure 1: increase in resource R specific to X… Which sector is ‘better off ’ in the economy and can trade internationally? (6. 3. ) 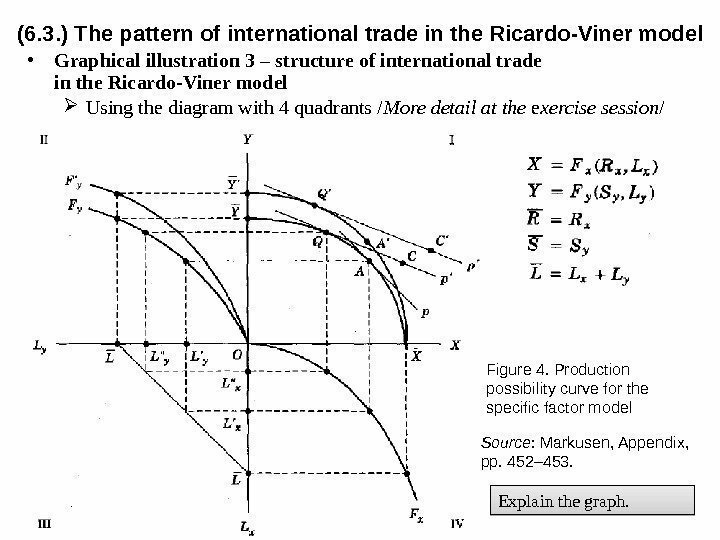 The pattern of international trade in the Ricardo-Viner model • Graphical illustration 3 – structure of international trade in the Ricardo-Viner model Using the diagram with 4 quadrants / More detail at the e xercise session / Source : Markusen, Appendix, pp. 452– 453. Figure 4. Production possibility curve for the specific factor model Explain the graph. (6. 3. ) 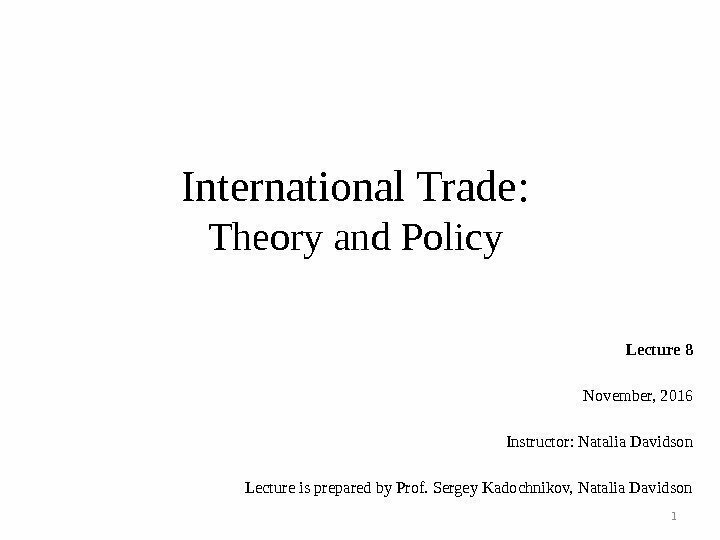 The pattern of international trade (структура международной торговли) in the Ricardo-Viner model • The pattern of international trade in the Ricardo-Viner model: conclusion In the specific-factors model, each country will export the good with the absolutely abundant stock of specific capital, assuming identical endowments of labor, the mobile factor; With differences in labor endowments, trade patterns will depend on the nature of the production functions and on the allocation of capital (that is, on the stocks of specific factors); Unlike the Heckscher-Ohlin-Samuelson model, trade structure in the Ricardo-Viner model depends on the immobile (specific) resource, not on the resource intensity *. * Which good is exported in the Heckscher-Ohlin-Samuelson model? 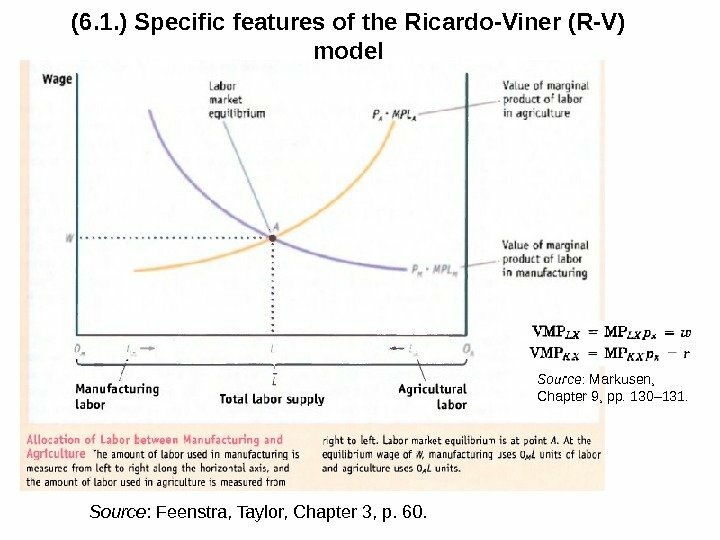 What about Ricardo-Viner model? (6. 4. ) Interrelation between change in final goods prices and production factor prices • Graphical illustration — interrelation between change in final goods prices and mobile / specific production factor prices Using the diagram with two curves representing marginal revenues of production factors; Using the diagram with 4 quadrants / Exercise session /; Figure 5. Autarky and free trade equilibria in the specific factor model Source : Markusen, Chapter 9, p. 131 and Feenstra, Taylor, Chapter 3, p. 59. (6. 4. ) 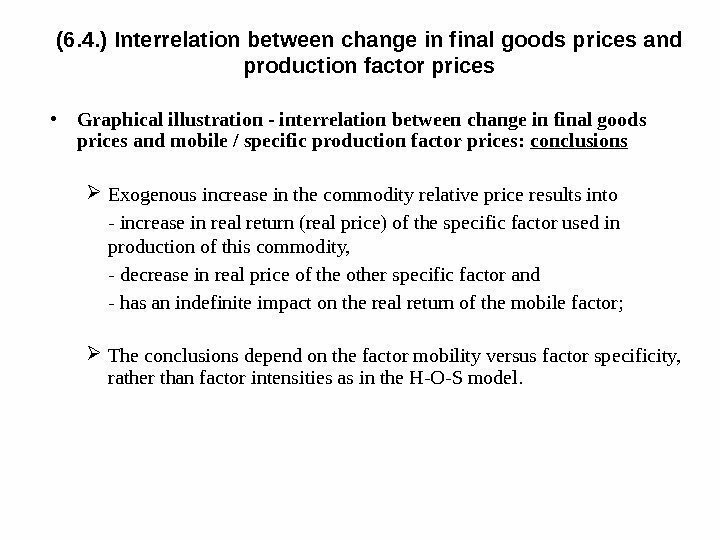 Interrelation between change in final goods prices and production factor prices • Graphical illustration — interrelation between change in final goods prices and mobile / specific production factor prices: conclusions Exogenous increase in the commodity relative price results into — increase in real return (real price) of the specific factor used in production of this commodity, — decrease in real price of the other specific factor and — has an indefinite impact on the real return of the mobile factor; The conclusions depend on the factor mobility versus factor specificity, rather than factor intensities as in the H-O-S model. • Does the Stolper-Samuelson theorem hold in the Ricardo-Viner model? The essential difference between medim- and long term effects from trade liberalization policy measures from the view point of gains and losses for the owners of production factors. Explain this statement. 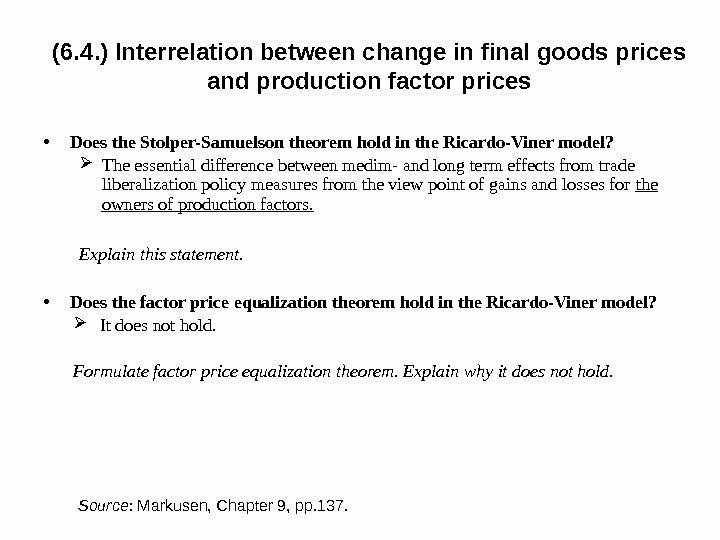 • Does the factor price equalization theorem hold in the Ricardo-Viner model? It does not hold. 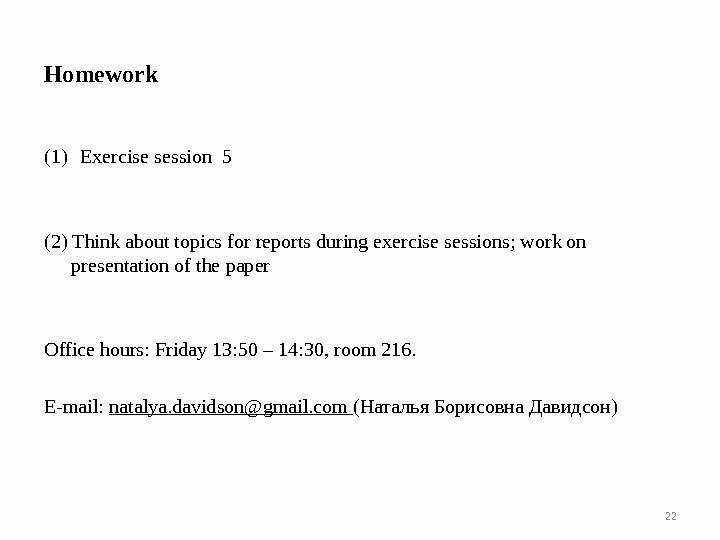 Formulate factor price equalization theorem. Explain why it does not hold. (6. 4. ) 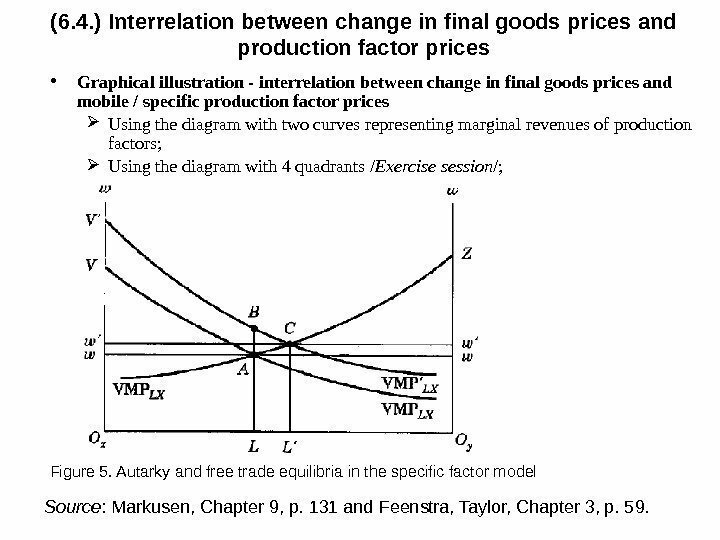 Interrelation between change in final goods prices and production factor prices Source : Markusen, Chapter 9, pp. 137.